No Bake Tapioca Cake is an eggless, naturally gluten-free Brazilian delicacy made from 6 staple ingredients, which is quick to prepare and served topped with sweetened condensed milk and coconut flakes. Start by boiling whole milk (or the same amount of water if your prefer). Meanwhile, combine minute tapioca, sugar, both coconut flakes and coconut milk, and 1 can of sweetened condensed milk in a large heat proof bowl or pirex. Next, add the boiling milk or water and stir well until obtaining a homogeneous mixture. Last, carefully run a paring knife around the edges to loosen the cake, place a serving plate on top, and invert the cake in order to unmold. Serve chilled and topped with the remaining sweetened condensed milk (1/2 can) and a sprinkle of coconut flakes. Garnish cake if desired (I garnished mine with berries and lime rinds). 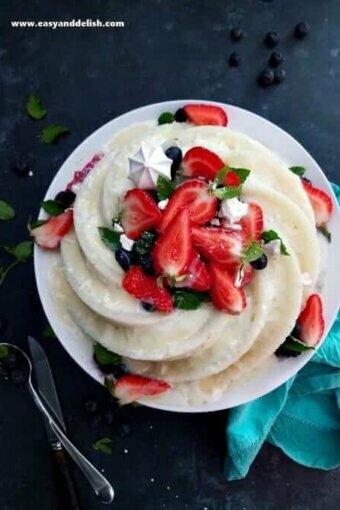 If desired, serve tapioca cake chilled topped with fruit compotes/sauce, lemon curd, melted guava paste, or your favorite caramel/milk chocolate sauce instead. If you decide to top with the traditional topping (sweetened condensed milk and coconut flakes), I suggest to sprinkle a bit of fresh lime rinds to add a bit of acidity and extra flavor to the cake. You can even squeeze the juice of 1/2 lime over the topping. Minute Tapioca as Tapioca Flour has a long shelf life but when mixed with other ingredients has its life shortened. This is why any leftovers of this tapioca cake must be refrigerated for up to 3-4 days. In addition, also try out shrimp tapioca crepes .